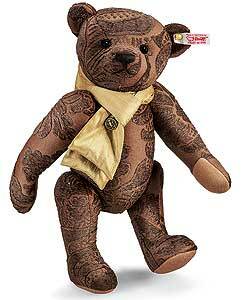 Our Steiff Anthony Teddy Bear is fully jointed and made of the finest brown jacquard. This beautiful piece wears the famous gold plated Steiff button in ear and is a limited edition of only 1500 pieces worldwide. Product details: safety eyes, synthetic filling material, non growler, total size 35cm. Comes boxed, together with a certificate of authenticity. Anthony comes from one of the most distinguished families in Europe. His sisters are Grace and Victoria from previous Steiff collections. Can?t you see the family resemblance? Like the sisters who came before him, Anthony is sewn from a unique brown Jacquard material that has been woven to create ornate three-dimensional designs. Around his neck, Anthony wears a knitted silk scarf with a old golden coloured button embossed with a heraldic mark. Naturally, Steiff has given Anthony the customary royal treatment. He has hand-stitched features and eyes that are also hand fixed to create his endearing expression. If you already own Grace and Victoria, then Anthony is a must-have for you. Even if you don?t own the sisters, Anthony would be proud to be a part of your collection.